A little bit more about Trinity Place. THE HISTORY OF "NEW YORK'S ORIGINAL TWIN TOWERS"
This lower Manhattan Restaurant & Bar is set up in an old bank vault that rests beneath a skyscraper that hides even more historic splendor. The vault at the Trinity Place bar and restaurant was originally commissioned by Andrew Carnegie and the New York Realty Bank. 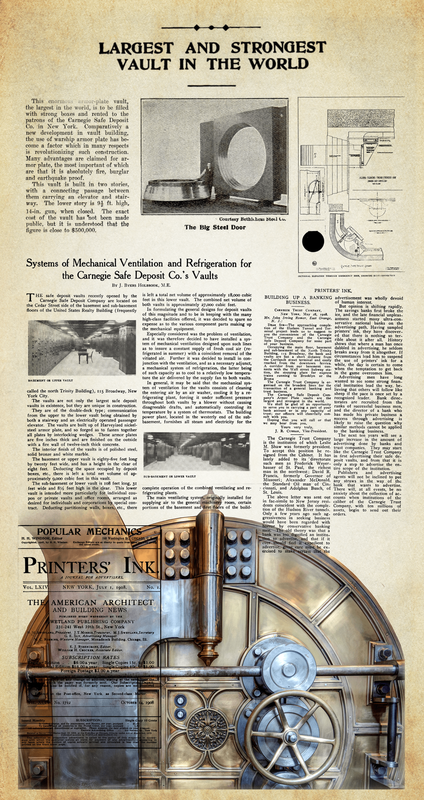 Built by the Mosler Safe Company in upstate Hudson, New York, the vault was so large and heavy it was sailed down the Hudson river and then transported on purpose built railway tracks from Battery Park to its home at 115 Broadway, where is still rests on the tracks today. The vault is unusual and unique as it has an entrance at either end, with each door weighing in at 35 tons. Restored from its dusty condition in 2006, the vault is now home to a contemporary, elegant Restaurant & Bar “Trinity Place” befitting its distinguished surroundings. The front dining area invites guests to a 40 foot mahogany bar anchored between the original five inch steel walls which have been left exposed so visitors enjoying a great bar menu (full menu also served at the bar) sipping signature cocktails, sampling some of our craft beers or enjoying our fine wine selection can have a sense of how secure and “Safe” the old vault was. The dining room, crowned with the original Brass Chandelier, was once the private meeting room for the banks executive board members and is available for all events. It is equipped with it's own full service bar and is a perfect place to give a rich and elegant feel to corporate functions, private parties, rehearsal dinners and wedding receptions in the famous/infamous Wall street area. 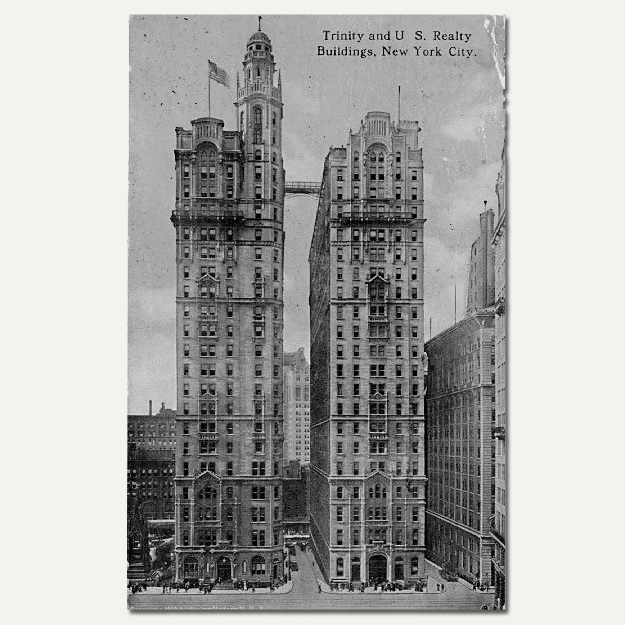 The 20th floor was even once home to the old Lawyers Club, a society so extravagant that it kept a private herd of 50 cows in New Jersey to provide its members with their own supply of fresh butter. Whether you're on your own or with a group, you'll be made to feel at home with our gracious, friendly service. His vision opening Trinity Place as a Modern Irish restaurant & bar is to highlight the burgeoning culinary delight that Ireland has become today on the worlds stage. “Irish Chefs have travelled the world gaining knowledge and experience and finally settling at home to open world acclaimed restaurants. ”Donal, being a native of Dublin, simply decided that NYC was his home to show case his culinary skills as an Irish born and reared chef. Bringing contemporary touches to traditional dishes and creating new, innovative dishes from the world around us today. Dishes include "Smokies", Smoked Haddock with Crème Fraiche, Scallions, Cherry Tomatoes and Dubliner Cheddar Cheese an Irish classic. Duo of Lamb with Beer Braised Shoulder, Grilled Top Loin and a Barley Risotto. The dessert menu has Sticky Toffee Pudding, Pavlova and Chocolate Sherry Trifle. Chef Crosbie is also baking daily traditional Irish brown bread and Guinness-Treacle bread, his mother’s recipe. Donal’s passion for food began as a child baking and cooking with his mother at their family home in Dublin, Ireland. At the age of 14 he secured a part-time job at a neighborhood eatery. His experience working there through high school led him to pursue a culinary degree in college, where his program included a number of instructive internships in kitchens throughout Dublin. Upon graduating, he landed a position at one of the city's most renowned restaurants - the five-star Shelbourne Hotel. After two highly influential years at the Shelbourne, Donal decided to gain further experience abroad. 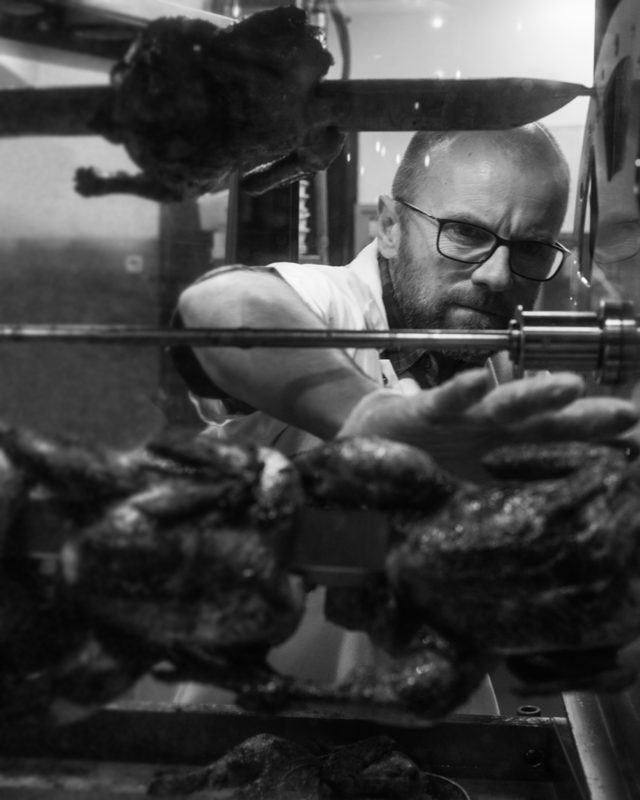 He moved to Germany, where he worked at French and Italian restaurants and then to Sydney, Australia, where he quickly became acquainted with the country's unique culinary scene, which blends indigenous ingredients and preparations with those of nearby Asian countries. He also took full advantage of being in the area by traveling through Thailand, Cambodia, Vietnam, Indonesia and Nepal and developing a keen interest in those countries' culinary traditions. Donal then returned to Dublin, where he worked at La Stampa - at the time Ireland's Restaurant of the Year. To this day, he cites his two years there under chef Paul Flynn as a key aspect of his development as a chef. From there, Donal decided to once again build on his professional experience, this time in the United States. He initially settled in California's Bay Area, helping to open Spago Palo Alto in 1997 and receiving a strong introduction to Californian Cuisine under famed chef/restaurateur Wolfgang Puck. In 2003 Donal was appointed Executive Chef at Morrells Wine Bar and Cafe in Rockefeller Plaza NY. While there, he had the opportunity to work closely with the sommeliers to create a menu to complement the extensive wine list. Donal also had the chance to create special wine dinners with world renowned wine makers, such as Oliver Humbrecht, of Zind Humbrecht. Donal is now the proud Chef and partner of three restaurants in NYC. The newly opened Hudson Hound Restaurant & Bar, The Bailey Pub & Brasserie and Trinity Place Bar & Restaurant. Donal came on board as Executive Chef and Partner in The Bailey Pub & Brasserie in 2010. Donal creates menus that compliment the diverse tastes of New York diners.